Thousands of people are expected to pay their respects to the late President George H.W. Bush as he lies in state in the U.S. Capitol Rotunda, which opens to the public on Monday at 7:30 p.m. Here’s what you need to know. 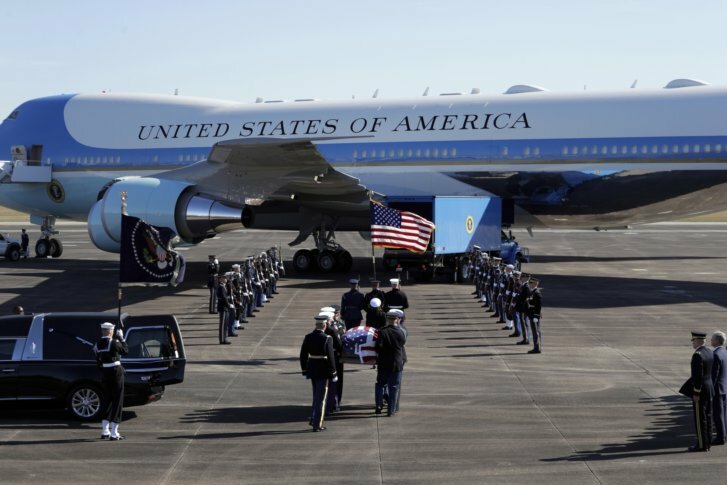 WASHINGTON — Thousands of people are expected to pay their respects to the late President George H.W. Bush as he lies in state in the U.S. Capitol Rotunda, which opens to the public on Monday at 7:30 p.m. The public viewing will continue from Monday evening through Tuesday, and end at 7 a.m. on Wednesday, Dec. 5. The state funeral for the former president — which is not open to the public — will be on Wednesday at Washington National Cathedral. All visitors who come to the Capitol the will enter through the U.S. Capitol Visitor Center, after waiting in line on 1st Street NE, between Independence and Constitution avenues. Be prepared for lines to be long, and road closures nearby mean there’s little to no parking. The closest Metro stops are Capitol South, Federal Center SW and Union Station. You may enter the Capitol with a cellphone, but it must be turned off. Photos and electronic devices are not allowed while visitors are in the Rotunda. Also note that flowers, sealed envelopes and other offerings or tokens will not be allowed inside the Capitol Visitor Center or the Capitol. U.S. Capitol Police recommend that those attending bring as few items as possible, so that security screening won’t be slowed down. See photos from the late President George H.W. Bush’s final journey to D.C., including events at the Capitol and Washington National Cathedral. Firearms, dangerous weapons, explosives, or incendiary devices including replica guns and ammunition. Bags exceeding the size of 18 inches wide x 14 inches high x 8.5 inches deep. As of Monday, public tours of the Capitol and Capitol Visitor Center are closed until 9 a.m. on Thursday, Dec. 6. Also, the U.S. Capitol Christmas Tree Lighting Ceremony scheduled for Wednesday has been rescheduled for 5 p.m. Thursday, Dec. 6 on the West Front of the Capitol.